The development of lightweight structures exhibiting a high energy dissipation capacity and a locally adapted puncture resistance is of increasing interest in building construction. As discussed in Chap. 7, inspiration can be found in biology, as numerous examples exist that have evolved one or even several of these properties. Major challenges in this interdisciplinary approach, i.e. the transfer of biological principles to building constructional elements, are scaling (different dimensions) and (at least for the botanic examples) the fact that different material classes constitute the structural basis for the functions of interest. Therefore, a mathematical description of the mechanical properties and the scalability is required that is applicable for both biological and technical materials. A basic requisite for the establishment of mathematical descriptions are well-defined test setups rendering a reliable data basis. In the following, two biological role models from the animal and plant kingdoms are presented, namely, sea urchin spines and coconut endocarp, and two experimental setups for quasi-static and dynamic testing of biological and bio-inspired technical materials are discussed. 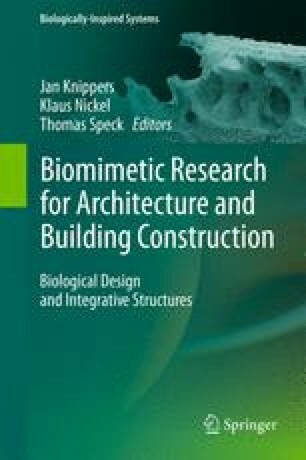 This work has been funded by the German Research Foundation (DFG) as part of the Transregional Collaborative Research Centre (SFB/Transregio) 141 ‘Biological Design and Integrative Structures’/project B01 ‘Scaling of Properties of Highly Porous Biological and Biomimetic Constructions’. The Plant Biomechanics Group Freiburg also thanks E. Heizmann and UNIVEG Freiburg, Germany, for providing the coconuts.